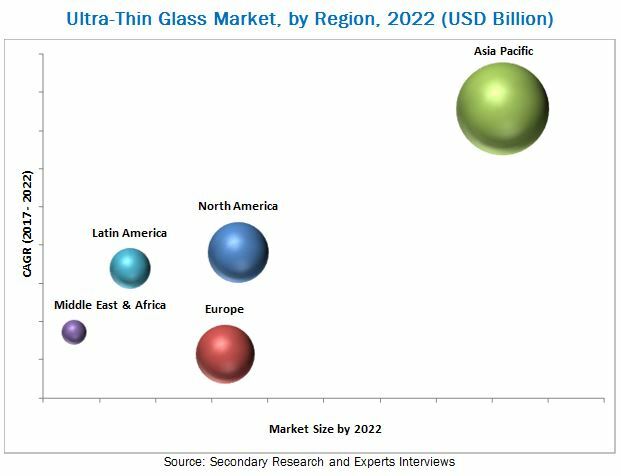 [156 Pages Report] Ultra-Thin Glass Market size valued at USD 8.73 Billion in 2016 and is projected to reach USD 16.99 Billion by 2022, at a CAGR of 11.8% from 2017 to 2022. This research study involved the extensive use of secondary sources, including directories and databases, such as D&B Hoovers, Forbes, Bloomberg Businessweek, and Factiva to identify and collect information useful for this technical, market-oriented, and commercial study of the ultra-thin glass market. 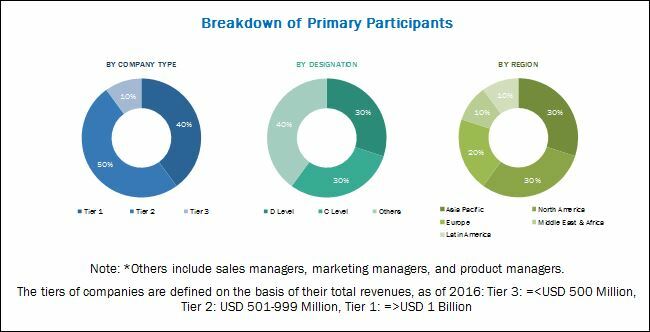 In-depth interviews were conducted with various primary respondents such as key industry participants, subject matter experts, C-level executives of key market players, and industry consultants to obtain and verify critical qualitative and quantitative information as well as to assess growth prospects of the market. The breakdown of primary interviews is depicted in the figure below. The ecosystem of the ultra-thin glass market comprises manufacturers, processors, and distributors of ultra-thin glass. Companies such as Corning (US), Asahi Glass (Japan), Nippon Electric Glass (Japan), CSG Holding (China), SCHOTT (Germany), Nippon Sheet Glass (Japan), Central Glass (Japan), Xinyi Glass (China), Nittobo (Japan), Luoyang Glass (China), Changzhou Almaden (China), Air-Craftglass (Netherlands), Emerge Glass (India), AviationGlass & Technology (Netherlands), AEON Industries (China), and Suzhou Huadong Coating Glass (China) are operating in this market. Along with the market data, MarketsandMarkets offers customizations according to the specific needs of the companies. A further breakdown of the Europe ultra-thin glass market into Austria, Denmark, Norway, Sweden, and Switzerland. A further breakdown of the Asia Pacific ultra-thin glass market into Australia, Indonesia, the Philippines, New Zealand, Thailand, and Malaysia. A further breakdown of the Latin America ultra-thin glass market into Chile and Venezuela. A further breakdown of the Middle East & Africa ultra-thin glass market into Iran, Oman, Kuwait, Iraq, Egypt, and Libya. Detailed analysis and profiling of the additional market players. The ultra-thin glass market is projected to grow from USD 9.73 Billion in 2017 to USD 16.99 Billion by 2022, at a CAGR of 11.8% from 2017 to 2022. The growing demand for ultra-thin glass from the consumer electronics segment is expected to drive the ultra-thin glass market. The ultra-thin glass market has been segmented on the basis of manufacturing process, thickness, application, end-use industry, and region. On the basis of the manufacturing process, the ultra-thin glass market was led by float process as it is the widely adopted process by the manufacturer. Based on thickness, 0.5–1.0mm is the largest segment, as major applications areas incorporate an ultra-thin glass of this thickness range. Based on application, the touch panel displays segment led the ultra-thin glass market in 2016. Based on end-use industry, the consumer electronics segment led the ultra-thin glass market in 2016, owing to increase in demand for ultra-thin glass in applications such as smartphones, wearable devices, and TVs. The Asia Pacific region led the ultra-thin glass market in 2016 and is expected to grow at a high rate during the forecast period. The growth can be attributed to the increasing demand for ultra-thin glass from consumer electronics, automotive, and biotechnology end-use industries, particularly in China and Japan. The ultra-thin glass involves critical manufacturing process, which eventually leads to rise in the cost of this glass. Therefore, ultra-thin glass market growth is restrained due to the critical manufacturing process. In addition, the presence of substitutes such as thin glass and plastic pose a major challenge to the growth of ultra-thin glass market. Corning (US), Asahi Glass (Japan), Nippon Electric Glass (Japan), CSG Holding (China), SCHOTT (Germany), Nippon Sheet Glass (Japan), Central Glass (Japan), Xinyi Glass (China), Nittobo (Japan), Luoyang Glass (China), Changzhou Almaden (China), Air-Craftglass (Netherlands), Emerge Glass (India), AviationGlass & Technology (Netherlands), AEON Industries (China), and Suzhou Huadong Coating Glass (China) are the major players operating in the ultra-thin glass market. These players have been focusing on strategies, such as new product developments & launches, mergers & acquisitions, collaborations, and expansions to expand their businesses in untapped and potential markets.